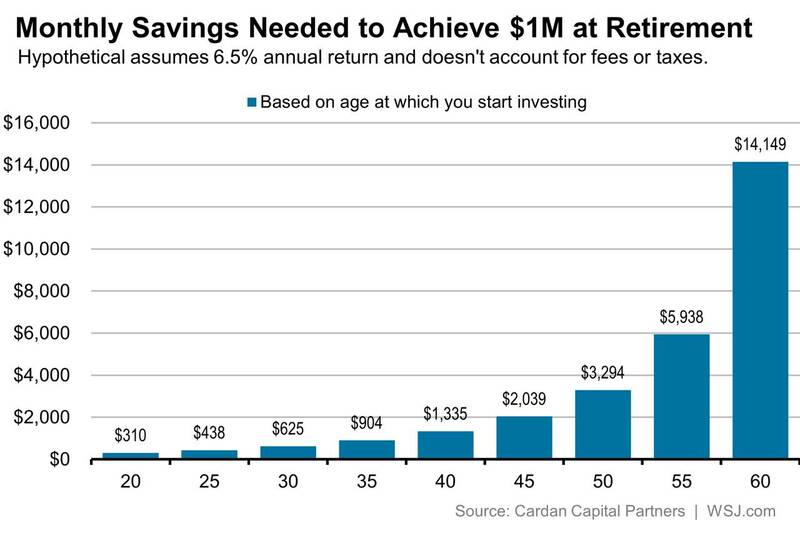 The Miracle of Compounding Illustrated: How Much Easier Is It to Save $1 Million If You Start In Your 20’s? So you are in your 20’s or 30’s and retirement seems so far away. Why bother saving for the future when there are so many things vying for priority in your budget today? This chart is a great illustration of why. To reach $1 million before tax at a 6.5% annual return by your 65th birthday requires saving $438 a month starting at age 25, $904 a month starting at age 35, or $5,938 a month starting at age 55. These are just illustrations, and they make no heroic assumptions about sky-high returns. You could do a lot worse than an index fund or target retirement fund from Vanguard. Just don’t invest money earmarked for a short-term need like living expenses or a downpayment on a house in the stock market. Put an amount in month after month, in up markets and down, and raise it if your income allows. Start your snowball young and give it a long time to build. Decades from now you will be happy you did. Beyond putting the money aside, your biggest temptation may be to sell or at least stop buying when the stock market has one of its occasional meltdowns. As long as you are broadly diversified and won’t need to touch the money for 5 to 10 years or more, you should ignore the market’s gyrations. The real risk in investing is the loss of purchasing power from inflation. Don Yacktman really seared this into my brain in this video when he made this point: 3% inflation for 100 years turns a dollar into a nickel. This is why your long-term money should be stock heavy. Life is all about choices and tradeoffs, and it can be hard to choose between spending now or investing for far away in the future. First of all, stay out of debt beyond a home mortgage, a car payment, or student loans. Paying debt down first makes a lot of sense. Beyond that, anything you put away today will make it much easier to reach your goals later. Your future self will thank you.